I received a few items from essence to try out for the fall winter 2018/2019 season. These items are gorgeous and useful all the way through the spring season as they are trending and will stay trending through spring. I have a holographic eyeshadow/face palette, bright pastel eyeshadow palette, beautiful glowing face palette and a holographic highlighting stick. 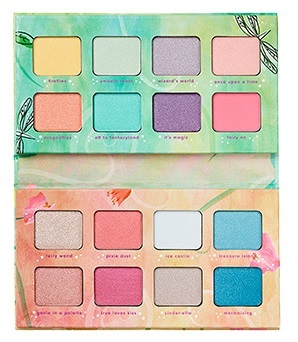 This awesome palette comes with four eyeshadows, an intensifying base and a brightening base. Use either base to make the eyeshadows look more intense (black) or brighter (silver) depending upon the look you want to go for. It can also be used on the cheeks, without the bases, to give an intense sparkle to highlight them and thus give a beautiful glow to the cheeks. This really lightens up the face and extends the trending holographic looks that are so popular right now. The eyeshadows look good dry or even better wet. This stick is a beautiful, creamy formula loaded with pink and gold pigments to create an iridescent glow on the skin. It goes on nicely and spreads out thin enough to look gorgeous on the skin thus having a beautiful effect on the cheeks. Cheeks will have a pink and gold iridescent highlight on the skin that will look absolutely stunning. 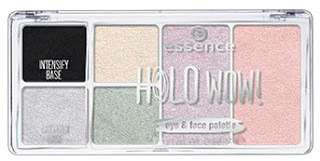 This palette contains sixteen shades of soft metallics, mattes and shimmers for a magical look that goes with the trending look of holographic beauty trending right now. This trend will continue into the spring, only to get brighter and look more stunning. Although they may look bright in the pan, these are pastel colors. The eyeshadows look good dry or even better wet. 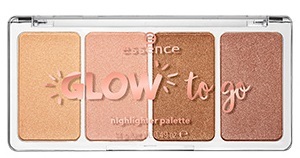 This gorgeous palette contains four beautiful highlighters in one palette to give you the most stunning highlighted sunkissed glow with either four colors or as many as you want, all depending on your desires. It has varying shades of sunkissed glow that are great for any complexion. essence cosmetics are available online through www.essencemakeup.com, www.ulta.com and ULTA Beauty. Like essence cosmetics on Facebook:https://www.facebook.com/essence.north.america; Follow essence cosmetics on Twitter:@essence_US; Subscribe to essence on YouTube: https://www.youtube.com/user/essencecosmetics; Follow essence cosmetics on Instagram: http://instagram.com/essence_cosmetics#; Follow essence cosmetics on Pinterest: http://www.pinterest.com/essencecosmetic/ and Follow essence cosmetics on Tumblr: http://essence-cosmetics.tumblr.com/.